In these tales from the 'Knightfall' epic, Jean-Paul Valley, the former Azrael, has taken over as Batman! As this untested Dark Knight struggles to keep crime in Gotham City under control, battling the Corrosive Man, Lady Clayface, the Ventriloquist, Scarface and others, Bruce Wayne retrains for battle with Lady Shiva! Plus, in a 'Zero Hour' crossover, Batman and Robin encounter an Alfred from another Earth! 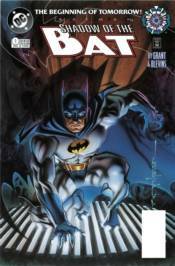 Collects BATMAN: SHADOW OF THE BAT #0 and #24-31 plus BATMAN: SHADOW OF THE BAT ANNUAL #2.